12 fresh sardines, cleaned, with heads and tails left on. ¼ cup of coarse sea salt. 2 tablespoons of freshly-ground black pepper. 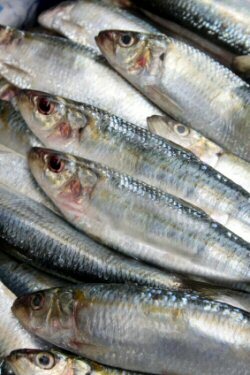 Clean the sardines under cold water. Drain and blot dry with a clean towel. Pour the olive oil over top of the sardines and gently toss to coat. Sprinkle the sardines with sea salt and black pepper on both sides. Cook the sardines for about 2 minutes per side.